All About Flax Seed Meal! Flax seed meal are grounded flax seeds. The Linum Usitatissimum is a blue flowering plant, found on the prairies of Canada. It bears several brown glossy seeds, called flaxseeds. These seeds have a sweet nutty aroma. They should be tightly sealed and stored in the refrigerator to prevent rancidity. Flaxseeds have benefits for the body, skin, hair and nails! FIBER: Has a balance of soluble and insoluble fiber. Flaxseed is a natural laxative. It maintains proper function of the digestive system. It acts like a sweeper, cleaning the colon of toxins, metabolic waste and dried mucus. It inhibits formation of disease causing organisms in the intestine. Stabilize blood sugar levels. PROTEIN: Flaxseed is a high protein source. It's considered to be a complete amino acid, essential for healthy metabolism and absorption of nutrients. Its protein increases energy. For every 100 grams of flaxseeds, you average 25 to 30 grams of protein. It helps maintain healthy skin, hair and nails. LIGNANS: Natural anti-bacterial nutrients. They have anti-viral, anti-tumor, anti-bacterial, and anti-fungal properties. They reduce activity of free radicals and flush excess estrogen out of the body, reducing the possibility of estrogen-like cancers. One hundred times more lignans are found in flaxseeds than wheat bran, rye, oats and soybeans. Lignans are found in flaxseeds, but not in the extracted oil. Some products have lignans added during production. MUCILAGE: Mucilage is formed by soaking flaxseeds for about 30 minutes. It's a light oil type of gel. It lubricates and absorbs toxins well. It prevents toxic build-up in the bowels and makes a gentle laxative. VITAMINS & MINERALS: Flaxseed has an impressive list of vitamins and minerals: Vitamin B1, B2, B6, Vitamin C, Vitamin E, Vitamin K, Calicum, Sulfur, Potassium, Phosperous, Manganese, Silicon, Copper, Nickel, Molybdenum, Chromium, Cobalt, Iron, Carotene, Zinc, Magnesium, Riboflavin, Niacin, Folate, Selenium, Pantothenic Acid. These vitamins and minerals maintain healthy cardiovascular, metabolic and circulatory systems. They improve brain function, boost immunity, improve skin condition and helps maintain a healthy colon. ESSENTIAL FATTY ACIDS: Flaxseeds have Omega 3 and Omega 6 essential fatty acids. The body cannot make these, they must be found from external sources. They are necessary for human well-being. Flaxseed has a high quality protein. It provides healthy cellular activity and skin regeneration. It's a natural exfoliate. Sprinkle flaxseeds or flax seed meal on foods like oatmeal, vegetables, cereals and breads. They can be a delicious and nutritious addition! Combine flax seed meal with Calendula oil and Mango Butter to soothe and soften dry flaky skin. Combine flax seed meal with oats and honey to draw out impurities. Combat acne or get rid of blackheads. Combine bits of flaxseed with Lemongrass and Sage oils to cleanse, exfoliate, moisturize, soften and soothe! Use a formula to make homemade soap or other homemade skin care products. Flaxseed oil is a fragile oil with a sweet nutty flavor and butter-like consistency. It's used in soaps, lotions, balms, creams, shampoos and conditioners. If you're making homemade products for the skin, hair or nails, use it in formulas that are well preserved with antioxidants. If the oil has any foul odor, do not use, discard immediately. Refrigeration and the addition of antioxidants will extend its shelf life. Refrigerate to avoid rancidity. Flaxseed oil can last from a few weeks up to six months. RECIPE # 1: Mix 2 tsp. 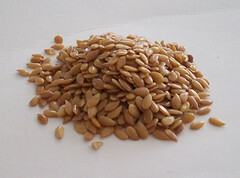 of flaxseeds with water, (using just enough water to cover). The seeds will swell and the water will become like gel. Apply gel evenly to face, avoiding eyes, ears, nose, mouth and any sensitive areas. Allow gel to dry on face. Rinse face, thoroughly, with lukewarm water. Gently pat dry. RECIPE # 3: Mix 2 tsp. applesauce, 2 tsp. flax seed meal and 1/2 tsp. Argan oil. Stir ingredients in bowl. Apply mixture, as a thin layer, to face. Avoid eyes, ears, nose, mouth or any other sensitive areas. Leave on approx. 12 minutes. Rinse face, thoroughly, with lukewarm water. Pat dry. RECIPE # 4: Combine 2 tbs. flax seed meal, 1 tsp. coconut water, 2 tbs. Greek yogurt and 1 tsp. honey. Mix ingredients together, well. Set mixture aside for approx. 15 minutes. (A gel type texture will form, due to the mucilage released from the flax seeds). Apply mixture, evenly, to face. Avoid eyes, ears, nose, mouth or any sensitive areas. Leave on face for approx. 15 minutes. Rinse face, thoroughly, with warm water. Pat dry. CAUTION! If you're allergic to any ingredients, in any recipe, do not use. If you're pregnant, do not use. If you experience any discomfort, discontinue immediately. Contact your health care provider, if needed. Your health care provider is the best source for your specific needs. The lack of Omega 3 essential fatty acids cause hair to be dry and brittle. Flaxseed oil helps stimulate follicles of hair. It assist in hair growth. It nourishes dry, brittle, hair. It leaves hair soft, shiny and moisturized. Improve dry scalp conditions. The lack of Omega 3 essential fatty acids can cause nails to be dry and brittle. Nails can easily split, break or crack. Flaxseed helps strengthen and nourish nails.